Ferron Salniker, Mezcalistas’ event manager and special correspondent extraordinaire, recently spent time in Oaxaca and Durango, researching the changing and evolving roles of women in the food and spirits world. This is the first of a series of articles. “The sky is very beautiful in Durango,” said Martha Garza, CEO of Cuero Viejo Mezcal. She’s driving us in her mini-van as we tour mezcal producers in Durango with a group of other Americans. We were on a two-lane highway, somewhere in between an industrial vinata that makes mezcal for Mexican millennials’ cocktails, and a 100-year-old vinata at the bottom of a mountain that mules traverse with piñas on their backs. Most of Durango looks closer to the latter vinata. This is a state of uninterrupted soil that hides pink quartz and volcanic rocks, and births towering paddle cactus. And she is right, the morning and evening skies in Durango bounce off the mountains and cliffs that seem they guard time from entering. It’s here that John Wayne rode through the horizon on horseback, ushering in an era of Hollywood filmmaking. “That’s why the industry here used to be movies,” she said. Now there’s a growing industry that also benefits from this same landscape of cenizo agaves and dramatic elevations: mezcal. It was first distilled when mining for precious metals began here about 400 years ago, but to compare the traditions and customs of Durango with other mezcal-producing regions like Oaxaca would be comparing membrillo to mangos. Tess Rose wrote about the region’s mezcal culture and traditions in this piece. 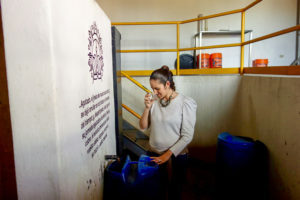 As the state’s mezcal industry grows, the people behind it also appear different from other regions, specifically, women– they are not only included, but they are pushing the industry forward on their terms. 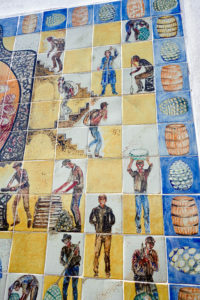 On the outer wall of the Lagrimas de Dolores distillery is a mural painted on a grid of tiles by a Mexican painter. It’s a yellow and blue shaded portrait of the Lagrimas vinata, with a number of masculine figures putting agave piñas through the distillation lifecycle. In the right corner is a female figure in a blue lab coat examining what looks like a beaker. 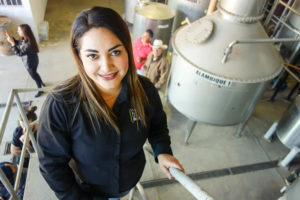 It’s Fabiola Ávila, master mezcalera and biochemical engineer. A mural by by artist Guillermo Ceniceros at Lagrimas de Dolores, with Fabiola Ávila depicted in the top right corner. In real life Fabiola is wearing her hair tightly braided and a beaded necklace, and her boots are scraped and worn. She pauses before answering questions from our group, thinking carefully about her words with the precision of someone whose job it is to make scientific calculations. 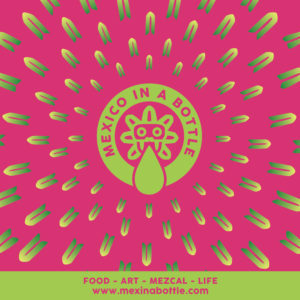 Fabiola came to mezcal through her degree in biochemical engineering. As a Durango native she was already warm to the spirit, and her fascination with understanding the biochemistry behind spirited beverages lead her to hobby distilling. A few years later (at 23) she started working for Lagrimas de Dolores. 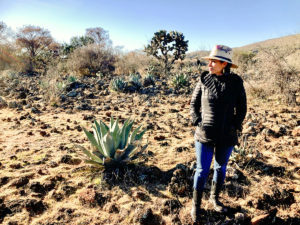 She’s still driven by the challenge of capturing the unique spirit of each agave, staying true to its essence so that the plant “doesn’t die in vain.” She said that part of her process is keeping an open mind and not having restrictive parameters for production. Like Fabiola, other women are finding mezcal through academia. It’s a contrast to Oaxaca, where access to higher education for many women from mezcal producing families and rural areas is out of reach. In Durango, many of the emerging brand owners belong to a middle and upper class that’s benefitted from the state’s resources (metals, timber, cattle)— and that includes a generation of women who have access to educational opportunities. That difference also allows women the freedom to travel and work in other states or countries, and then integrate their experiences and skills into the mezcal business in their home state. 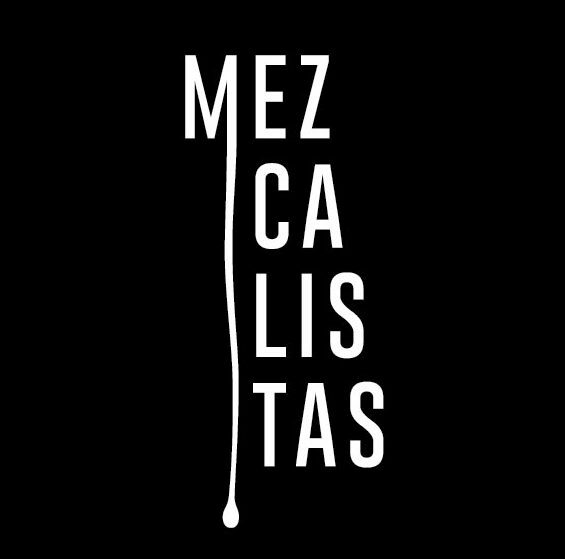 The result is a level of economic independence and social capital for women that might be less common in other mezcal-producing areas. Emily Garcia Montiel, CEO of 618 Mezcal, has three higher education degrees: an MBA, a masters in marketing, and a doctorate in forest and agriculture studies. 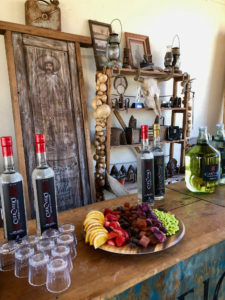 During Emily’s first run in business school an interest in local economic development pulled her to Nombre de Dios, a hub of mezcal production in the state. Her thesis, a look at how 60 mezcal producing families could sustainably grow mezcal into a local economy, inspired her to start her own line. She was also in her early 20s. “In Durango I think there are more opportunities for women than there might be in other states: we have greater access to education and a greater academic formation. And we have been motivated to pursue our own ideas,” said Emily. 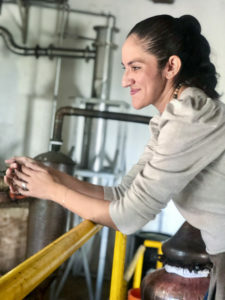 Her label specializes in an industrially-produced low ABV mezcal meant for cocktails— a gateway drink for young people in Durango who she said are still warming up to the spirit. At the time when Emily began her mezcal career, there were only a few commercialized brands in Durango, and she was one of the first people to blaze the path from product to certification (the marketing degree came during that process). Her doctorate has given her the opportunity to approach reforestation and sustainability from an investigative approach—a circle back to her parents’ careers as academics in forestry. She recently got accepted to a national research program to work in collaboration with the local university. 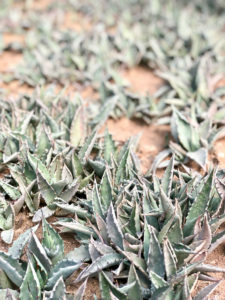 There’s a nursery in back of the vinata where two agaves are planted per bottle and then brought into the wild, where they have replanted 200 hectares of cenizo agaves. Baby cenizo agaves at the 618 Mezcal vinata. “I think because I was a woman, I was young, and didn’t come from a family of mezcal producers I was viewed an outsider,” said Emily. “But I just kept participating in events, showing up and continued to put forth ideas that were good for the sector as a whole. I had to earn my place, but I think it’s a new environment now,” she said. 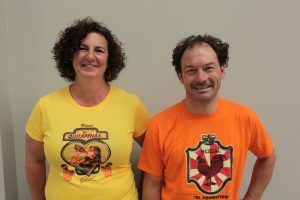 Emily and Martha were two of the three main organizers for our trip to Durango, put on by Espiritus de Durango, a group of mezcal brands working together to promote the sector as a whole. Emily said that focusing on the collective success of the industry has softened some of the skepticism and jealousy from men in the industry. She thinks her work has opened doors for other women, even by just providing an example of what’s possible. Martha also has an MBA and is a restauranteur, and her expertise helped breathe new life into Cuero Viejo— a brand started by her brother and father, and now a daughter-father operation. The vinata is also in Nombre de Dios, and construction for a spa and hotel next door was underway when we visited. The vision is a complete mezcal experience, and after getting to know Martha— her attention to details, natural beauty, the mythology behind mezcal and Durango’s landscapes— it’s easy to see where the idea came from. At the Cuero Viejo vinata. “My dad is practical and grounded, and I think we compliment each other, because I’m creative and detail oriented,” she said. While she watched her mom work alongside her dad in the cattle business, she said getting in the trenches with him helped close a generation gap. It also pushed her to own what she sees as her strengths as a woman: she’s passionate, maternal and sensitive, and she does often see things differently than men— and that’s a good thing. Her work now is to apply that to rebranding the label and preparing it for the international market. Back in the minivan, we’re talking about the triple roles women can play these days— as workers, mothers and the head of domestic/household duties. Despite how helpful her husband is (she professes multiple times), Martha might be the prototype. On the drive, in between drilling us for information about entering product into the U.S. market, helping coordinate the tour and steering us through the desert, she’s also on the phone checking on her kids and her husband. I can tell her voice is a little hoarse but she doesn’t seem to slow down at any point in the trip. “I don’t think I’m showing my daughters that I just sell alcohol,” she said. “I think I’m showing them that I have the confidence to do what I love and that I have a passion for people, for Durango, for culture and for my job.” The idea that she gets to do something she loves still trips her out. Fabiola also has children, toddler-age twins and one on the way. Her husband is also a biochemical engineer and mezcalero at Lagrimas. She said at some point, even if she has to take some time off, she wants to have a vinata at her home. I asked what it’s like to take care of the kids and have her mezcal babies at work. Fabiola Ávila looks over the Lagrimas de Dolores distillery.